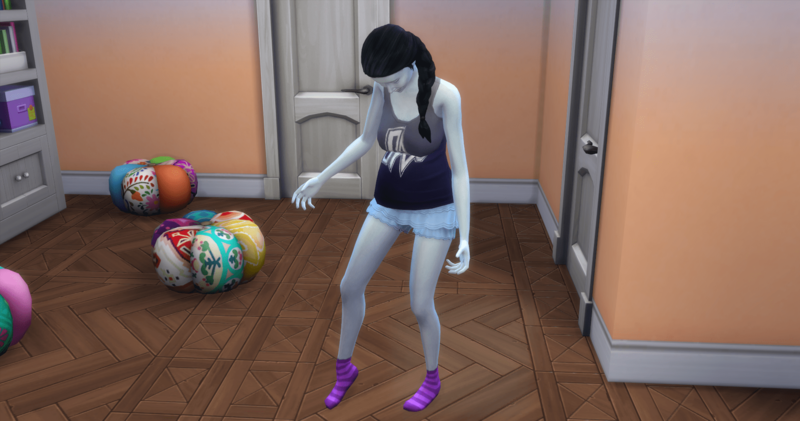 Gwendolyn grew into a teen, and as I plan for her to be my only vampire in the family, she will be completing all three vampire aspirations. I hope. She cannot complete them as a teen – they each have a stage where the actions required are not available as a teen – but she gets all three aspiration to that point. In order to feed, she heads out of the house and begins visiting households in Willow Springs. She drinks deeply from each sim she encounters until her thirst is quenched. Once she starts working on Good Vampire, she won’t be able to drink without permission. She is a kleptomaniac and has the ability to enter without being invited, but can’t seem to get into the houses without knocking. Not sure if this is a failure to enter or a learning curve? But for each household, she enters, drinks, steals, and leaves. Giving up on breaking and entering for now, she just starts drinking from walkers. Hilary is still coming over after school every day. She and Gwen have been friends since they were babies. Hilary moved out as soon as she became a toddler so they never played together in the house, but were instant friends when they met again in primary school. 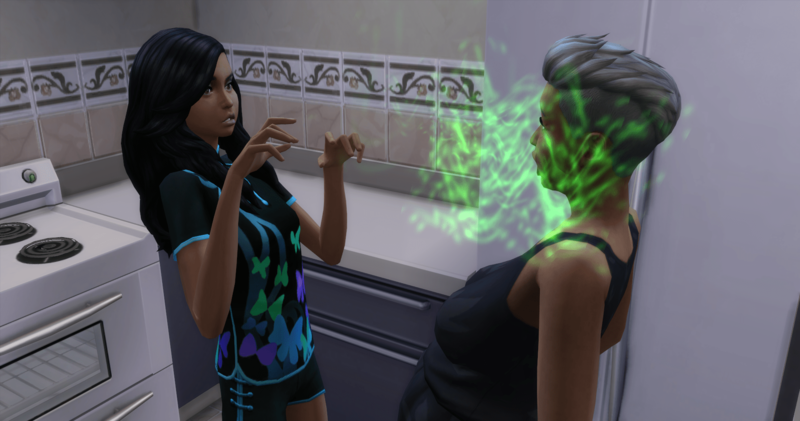 Fiona is sick a lot – and she gets the most interesting rashes. I have given up medicating her – she just rides it out. She is working in the social media career so she generally chooses to work from home. This allows her a lot of freedom in choosing when to work and when to sleep. Gwen needs lots of fish and frogs in order to make enough plasma packs to handle her thirst. 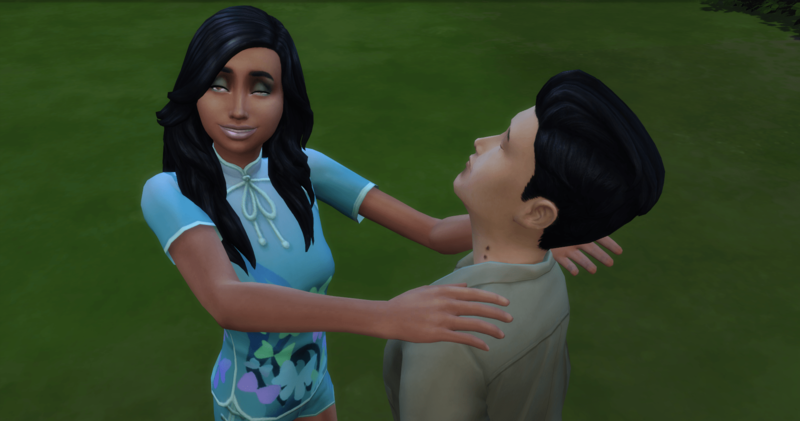 I am getting better at handling a vampire – and it helps she is immune to the sun and has a tamed thirst. Myra was immune to the sun but had an insatiable thirst, which is why she had to move away. 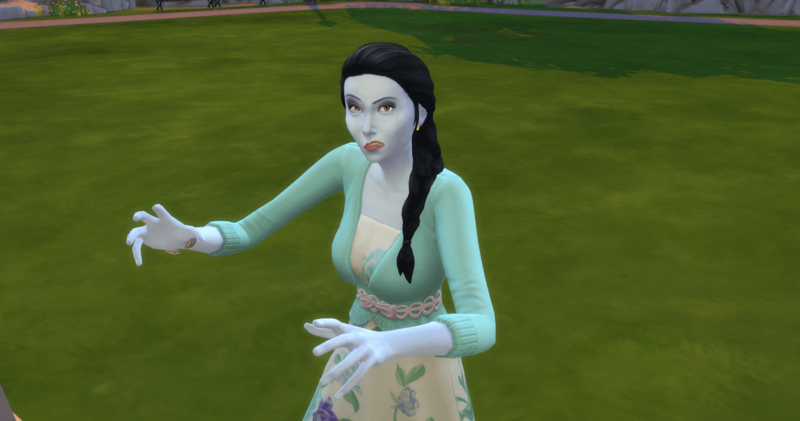 Gwen spends her time working on her vampire skills. She ranks up fairly quickly, reaching Grand Master as a teen. 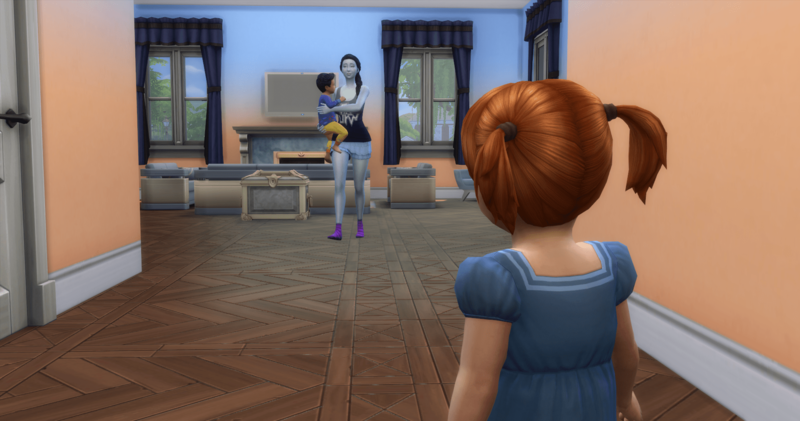 For Vampire Family, Gwen has to convert five sims into vampires. 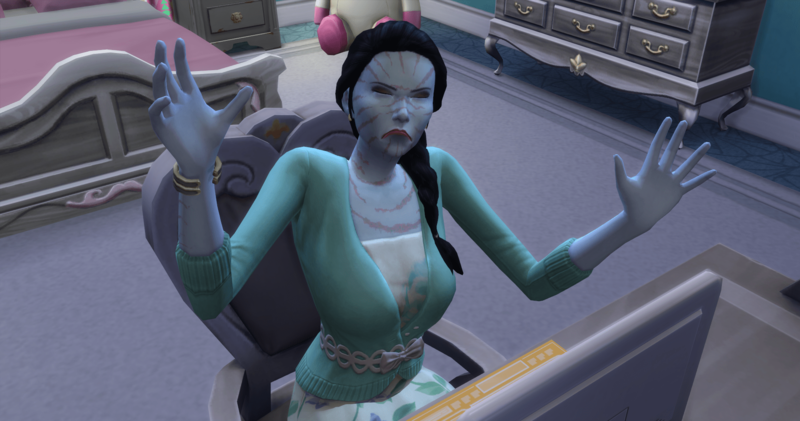 Avoiding the family, she randomly chooses two single sims and a household of three. These are the two single sims – no pictures of the household as they changed in privacy. These two were “in the neighborhood” when they changed. Gwen is still trying to figure out how to handle her thirst. With a Withered Stomach, the plasma fruit salad is not a good idea. After spending way too much time throwing up, she marks that off of the list. Next to try is the Plasma Jane. It doesn’t make her sick but it doesn’t help with the thirst. Eating plasma fruit directly doesn’t help either, so her options are plasma packs or the fresh feed. Fiona has finally finished her second aspiration. 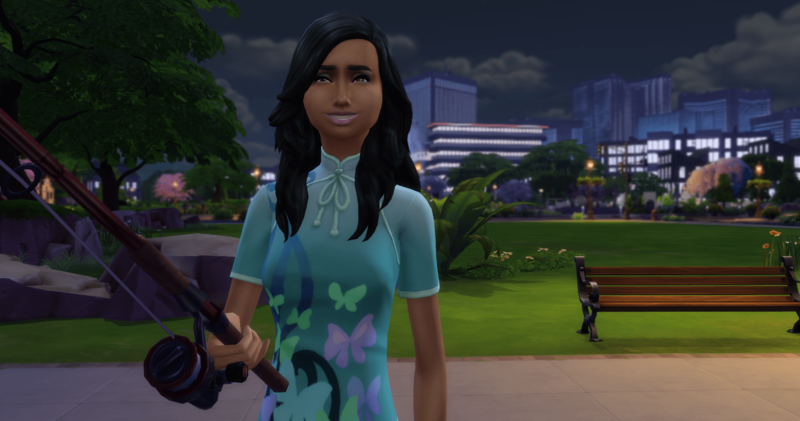 When Fiona became a young adult I changed her aspiration to popularity. 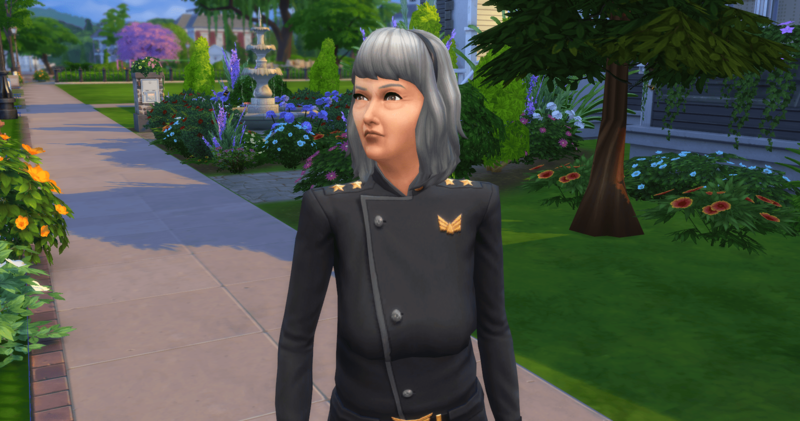 She completed Leader of the Pack and then changed back to the creative aspiration she chose as a teen and I forgot that she still needed to paint four masterpieces. So was spending all of her time working on social media or painting and she finally completes Painter Extraordinaire. Jackson comes out to congratulate her and she realizes that time is slipping away. When did he get so old? She decides that if they are going to have children, they need to get with it. Jackson is excited to hear that she is ready. 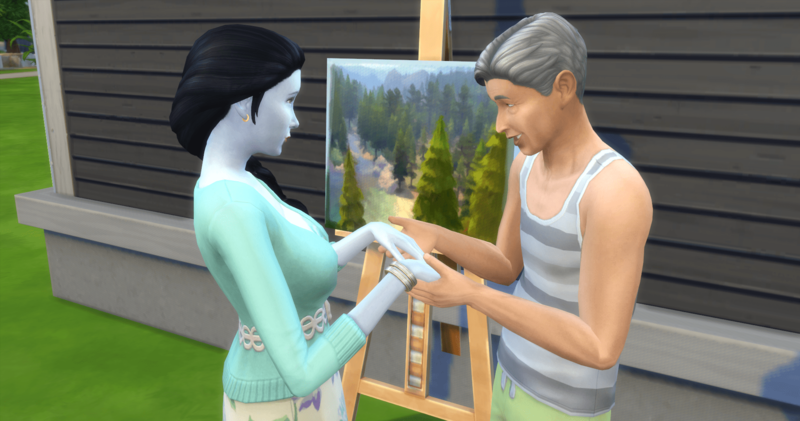 He has been quietly painting to support the family and cleaning up around the house and now he is going to be a daddy. Unfortunately, Fiona is getting older also and she has trouble conceiving. 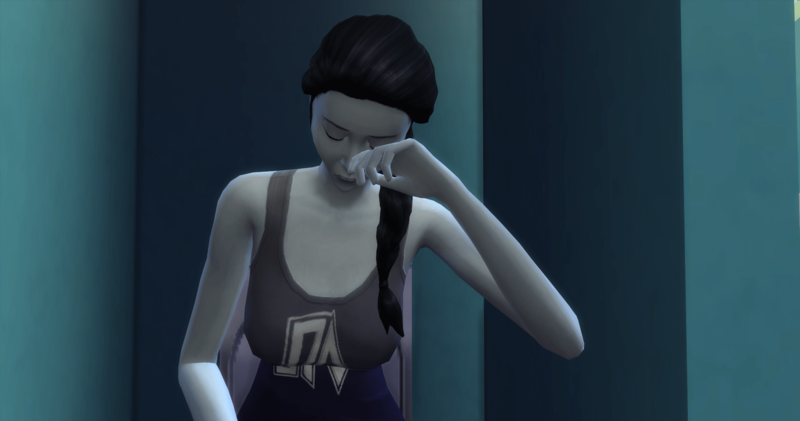 Each negative pregnancy test takes a toll on her already unpredictable emotions. It takes three attempts to get a positive pregnancy test result. But, they finally have a nooboo on the way. After telling Jackson, Fiona goes to bed. She was either exhausted from repeatedly trying, or she was sick again. Either way, she needed lots of sleep. This is Gwen’s dark form. The only difference is her clothes are black instead of brightly colored. 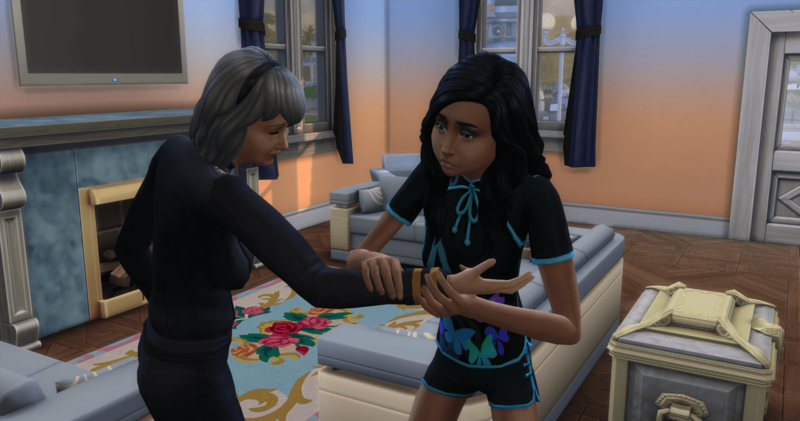 I don’t know if I am doing something wrong, but I thought I would be able to change her dark form once she became a teen. The only options I get are her clothing. 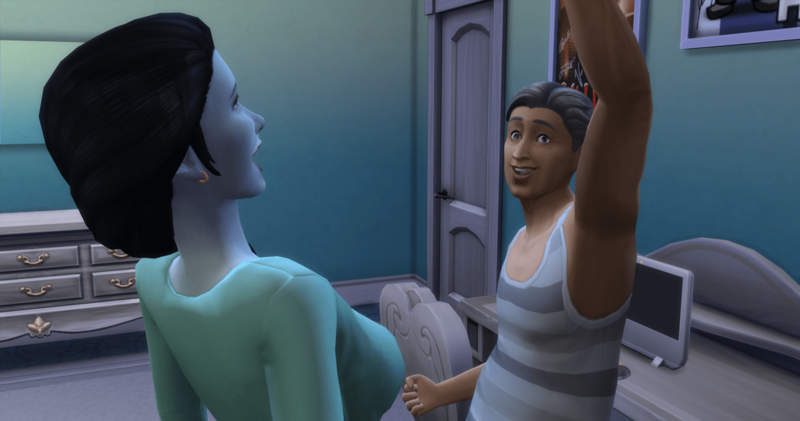 Gwen runs into Myra and they talk about being vampires. 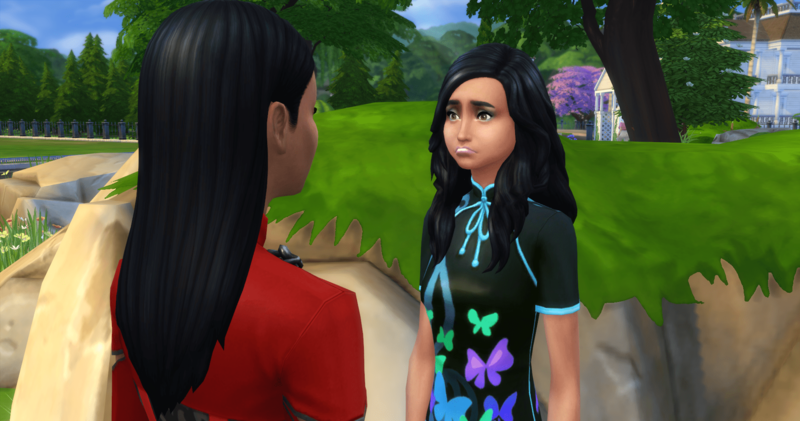 Gwen asks for advice on getting sims to give her permission to feed. Myra doesn’t have this problem – she just compels compliance – so she can’t help. 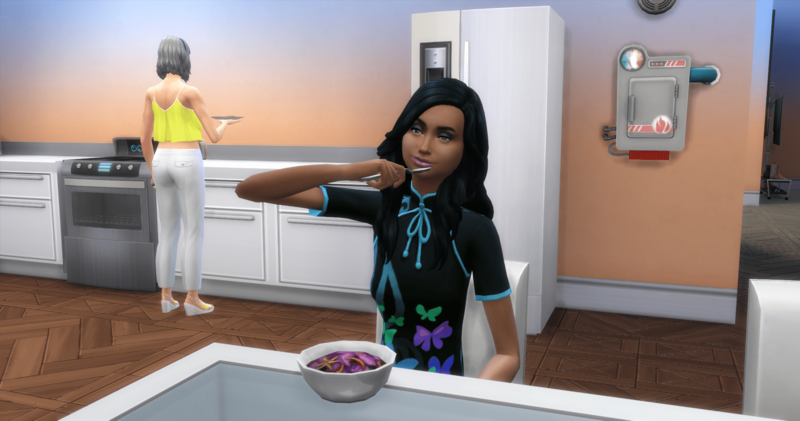 One of the tasks for Good Vampire is to get two sims to give permission for her to feed. One of the things I have learned is that the conversation has to be at least pleasant and the higher the friendship, the better chance of them agreeing. Starting with her strongest relationships, Gwen approaches Cybele and actually gets permission. WooT! The next strongest relationship Gwen has is with Fiona; however, Fiona is pregnant and off-limits. This means Hilary is the next candidate. And, she says Yes. 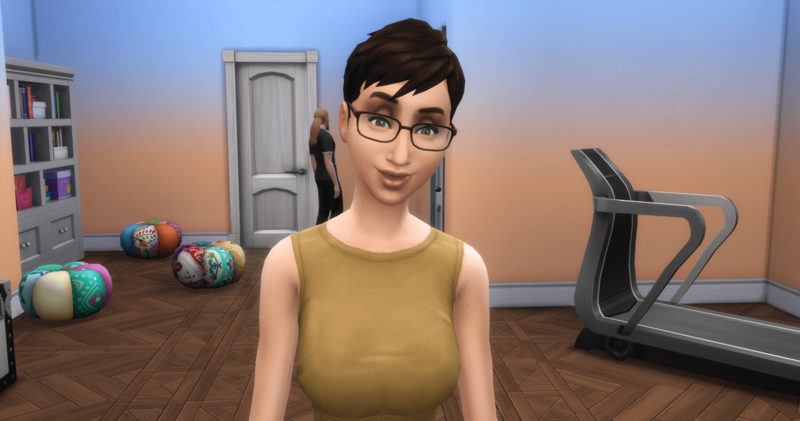 Fiona thinks it is time for the baby – was that a contraction? Yep – her water broke (okay, she peed on herself, but the timing was perfect). For the Master Vampire aspiration, Gwen has to win three battles – either fights or spars. She asks Myra to come over to spar. Gwen has vampire might (Myra doesn’t) and wins 3 out of 4 matches. And our first pictures of generation 5 – Greg Brooks – an Angelic child. 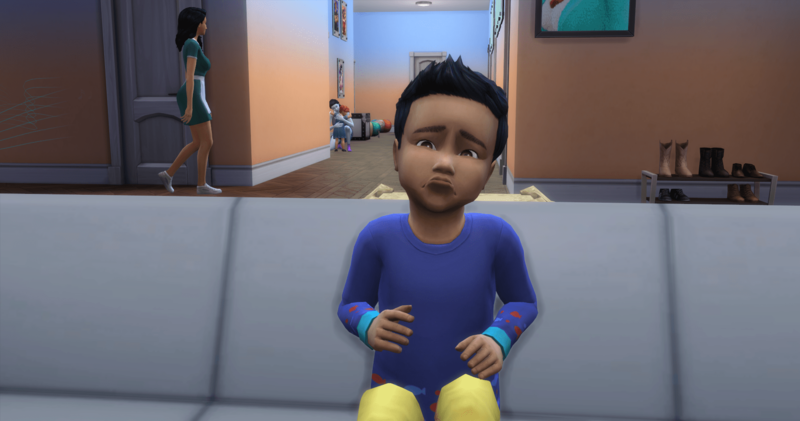 My first angelic toddler and he won’t do anything unless an adult asks him. He just stands around and babbles to himself or dances to the radio. Any emotion results in a request for comfort. But a cute kid and a potential heir. 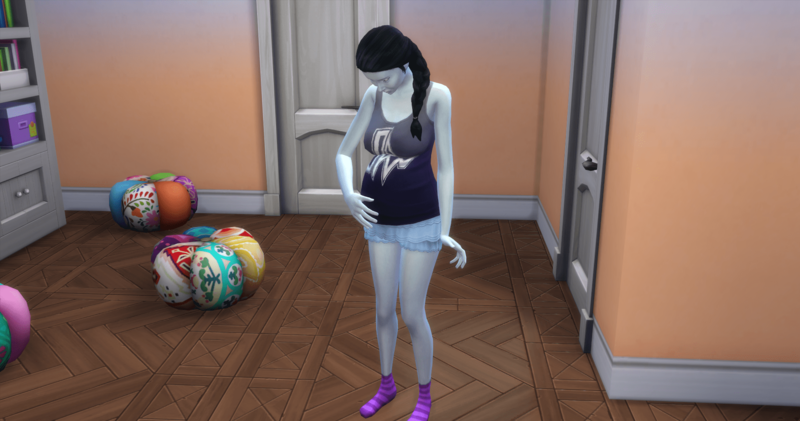 Fiona and Jackson decide to have one more baby – I am hoping for alien skin. Instead we get a red-headed girl. If you follow my stories, you will recognize my preferred heiress. The only thing that could be better would be if she had Fiona’s skin tone. But she doesn’t. Ilia is a Charmer. After her first potty training, which results in an accident, she asks Fiona for comfort. In the living room, Greg is just sitting on the couch, sad because Fiona is hugging Ilia. He was exhausted but wouldn’t get off of the couch to go to bed on his own. He kept calling for Fiona to take him to bed. Finally, Fiona gets him and takes him to bed. Ilia stands in the hallway and watches them. The little angel realizes someone had an accident and really is hoping it wasn’t him. That would be awful to be the one that peed on the floor, next to the potty. 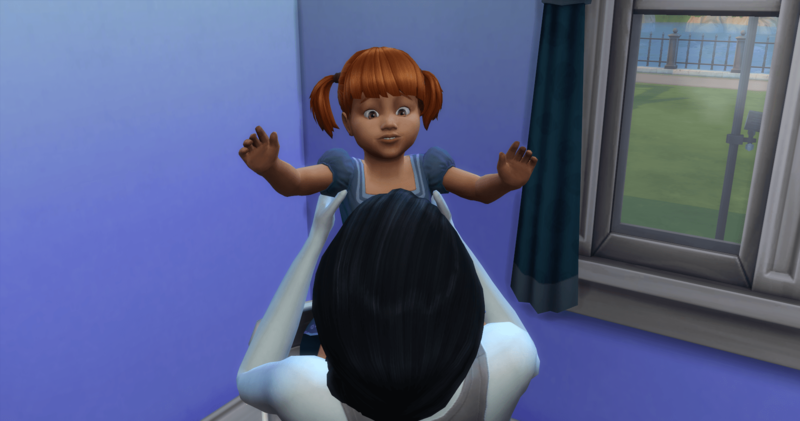 (It wasn’t – Cybele was potty training Ilia and couldn’t hold it any longer herself.) 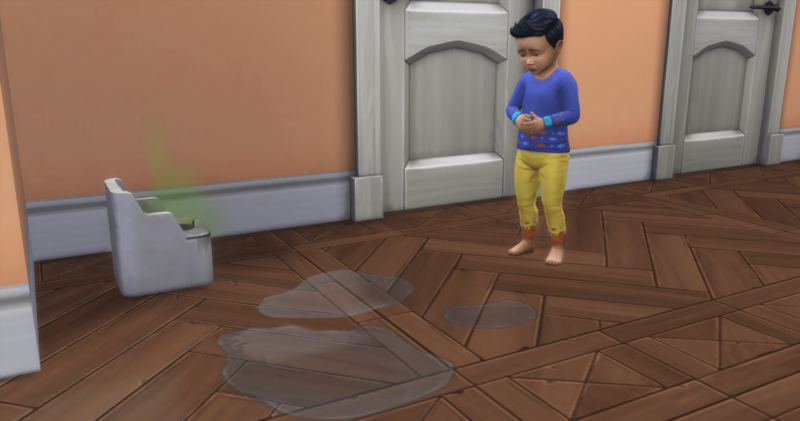 Greg stood looking at the puddle with the “What’s This” action and the saddest face. 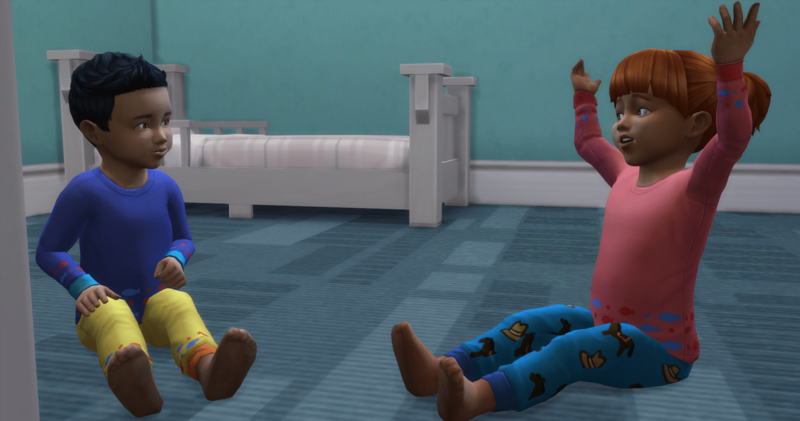 Finally the toddlers are awake at the same time. They were on opposite schedules after Ilia grew up and it has taken time to get them on a similar schedule. They sit in the nursery and babble at each other. Greg was excited when he met Ilia for the first time, so it is good to see them getting along. Two popups about starving toddlers, two toddlers trying to eat. What isn’t showing in this picture is Jackson queueing to pick Greg up, put him down, pick him up, put him down. I had to send Jackson to the chess table so that Greg could eat in peace and not meet the social worker. 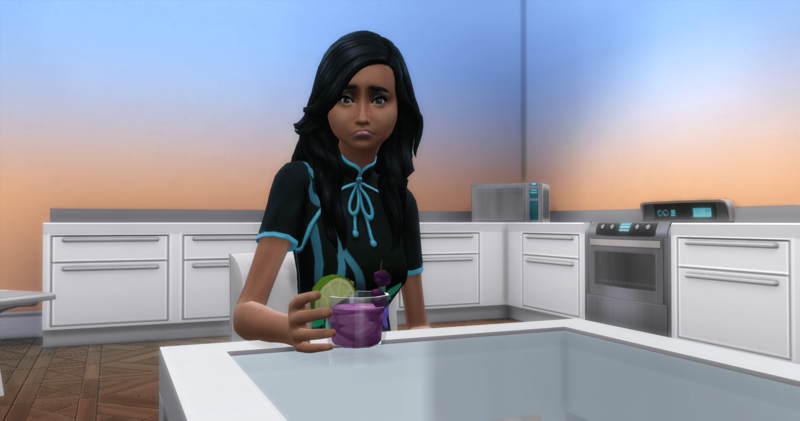 Ilia doesn’t look too excited about her yogurt. Greg’s bacon and eggs look really good though. And what would legacy life be if someone didn’t fall asleep where they shouldn’t. 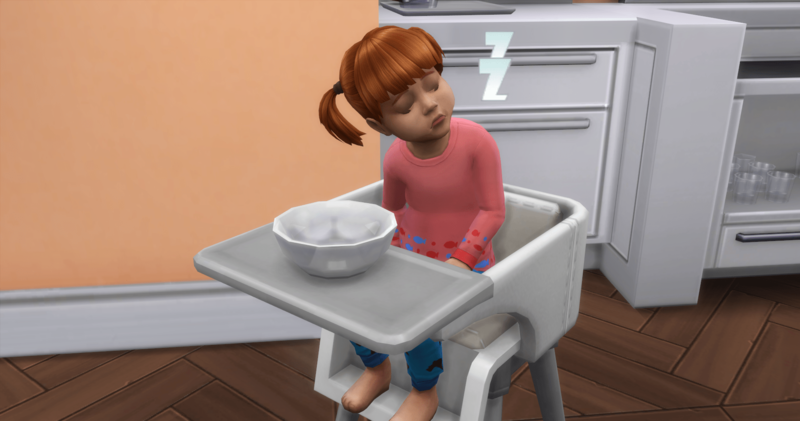 Everyone went to bed and left Ilia in the high chair. She can’t keep her eyes open and dozes off, hoping someone remembers her soon.